I found this recipe - or well, sort of - in a lovely new cookbook by a fellow food blogger: What Katie Ate. It's an absolutely gorgeus book - food photography is great, and I have several bookmarked recipes for the future. This one was first though - as soon as I read it, I sent husband on a hunt for red grapefruit, and then we had this for lunch. Start by placing the parma ham on a baking sheet, and drizzle with the honey. Bake at 200°C for 6-7 minutes. Take the sheet out and let the ham cool. It should be crisp enough to shatter into little crunchy pieces. Whisk together the dressing in a small bowl. 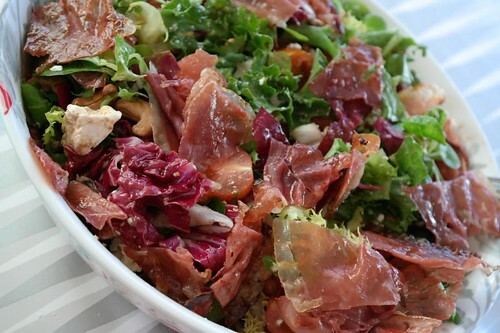 In a salad bowl, add the salad leaves, cherry tomatoes, grapefruit and cashews, and toss with the dressing. Top with the feta cheese and crispy ham. feta + greiphurt - my farorite combination!